Gently heat milk in a pot over medium-low heat until just lukewarm. Add fresh yeast and some of the sugar and whisk for approx. 2 - 3 min., until the yeast is completely dissolved. Add flour, remaining sugar, salt, some of the softened butter, and eggs to a large bowl and mix with a hand mixer with dough hooks until combined. Add yeast-milk mixture little by little until a smooth dough forms. Flour your work surface and form the dough into a ball. Transfer the dough back to the bowl, cover with a clean kitchen towel and let rise in a warm place for approx. 1 hr. , or until the dough has doubled in volume. Flour your work surface and divide the dough into 8 equal-sized pieces. Form each dough piece into a disc, add a tablespoon of plum jam into the center of the disc and fold dough gently over the filling, pinching the seam. Form into round dumplings and let rest again for approx. 15 min. In a pot, bring water to a boil. Transfer the yeast dumplings to a sieve inside the pot, but make sure that sieve and water only touch slightly. Cover and let the dumplings steam over medium heat for approx. 12 – 15 min. Melt remaining butter in a small pot and set aside. 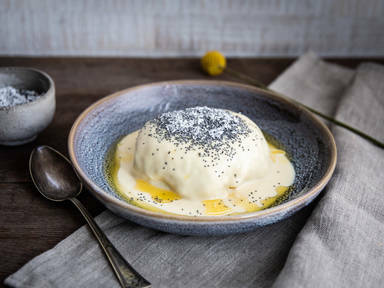 Combine confectioner’s sugar and poppy seeds in a small bowl. Serve dumplings with vanilla sauce and some melted butter. Sprinkle with poppy seed and sugar mixture. Enjoy!